Taikyoku Budo originated as a set of principles, a different way of looking at martial art techniques and the body skills and mechanics that make those techniques work. The idea, originated by Ellis Amdur, was to give practitioners of the so-called aiki arts, aikido specifically, a set of solo exercises for conditioning the body in a way that would both engrain the movement patterns utilized in partner practice so that those would be more instinctive in a freestyle setting and would also provide a container for a specialized kind of strength training. Budd Yuhasz then saw the universality of these principles and began applying them to grappling and striking. The history of Taikyoku Budo has been written about from multiple perspectives on the Taikyoku Mind & Body site, however, so I will get directly to the point of this particular post. Taikyoku Budo requires that the practitioner maintains his or her options throughout a martial encounter. One of the fundamental principles of Taikyoku Budo is that all desirable grappling positions are reversible. That is, for a position to be considered ideal in Taikyoku Budo, it must give the practitioner three strategic options: maintain, aggress, or egress. In other words, the practitioner’s goal is to get to a position from which he or she can control the opponent using a pin of some sort, do damage to the opponent with strikes, or get up and get away from the opponent with minimal resistance, all while minimizing the opponent’s ability to defend attacks or do counter damage. This means that any position from which the practitioner cannot easily disengage is not desirable because that position is not reversible. Many of the best positions for submission grappling (BJJ), and even MMA, such as full mount (high mount is an exception), closed guard, or side control, do not meet this requirement because the person in the less dominant position (uke or ‘receiver’) can still hold the person in the dominant position (tori or ‘taker’) in place by way of a bear hug or the like, making it difficult to disengage and escape, even from the top position, should the circumstance warrant it. Imagine being stuck in full mount while the person on the bottom holds you there so his friends can kick you in the head or securing a perfect side control and the person on bottom suddenly pulls out a knife. These are genuine problems worth considering, but no martial art is meant to do everything perfectly. 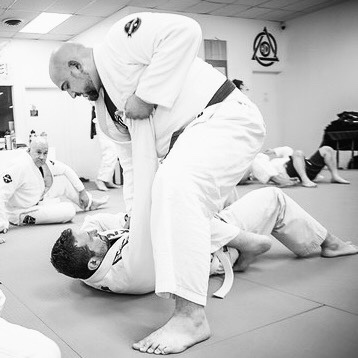 With limited time to train, we must specialize so that we can maximize our skills in whatever aspect of the martial arts we feel best suits our goals. For Taikyoku Budo, for our ne-waza (ground grappling) training goals, uki gatame (‘floating pin’ or ‘floating hold’), commonly called knee-on-belly, knee-on-stomach, or knee ride, is the ideal position. Uki gatame is most often seen as a transitional position in submission grappling because it is not the most secure pin from which to attack the neck, arms, or legs and it is often difficult to maintain in MMA because of the slipperiness and flailing that happens in the fight, but the transitional nature of this position is exactly what makes uki gatame perfect for Taikyoku Budo, namely that it is easy to move in and out of. From uki gatame, tori can pin uke down, land devastating elbows or hammer fists, or disengage and retreat or reengage from a better angle. Uki gatame is a position of options.